AEK Technology is an authorized distributor for several manufacturers in the aerospace, defense, and industrial markets. Among those are Barry Controls Defense and Industrial, Vlier, Airdrome Precision Components, and Barry Controls Aerospace. AEK Technology has been recognized as the largest Barry Controls distributor in the world and is the only one with former Barry Controls engineers on staff. Click the Barry Controls or Hutchinson logo to access their product information contained in our web site. 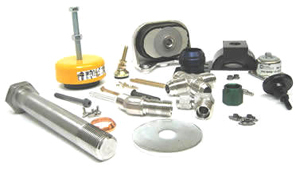 With over 30,000 items in stock ranging from hydraulic fittings to casters to vibration isolators and shock mounts, AEK Technology is ready to support our customers with fast response, technical support, and reliable delivery. Use the Inquiries & RFQ'S link above for fast response to your parts needs.